This study was performed to identify the growth behavior and survival of Wharton�s Jelly Mesenchymal Stem Cells (WJ-MSCs) on corroded surfaces of Bio-metallic alloys of Ti6Al4V and AISI 316L for biomedical applications and bone tissue regeneration. The bioactivity of WJ-MSCs and growth rate was studied in contact with corrosion products on surface of aforementioned alloys by Fluorescent Microscopy which revealed that the cells proliferation is more widespread on Ti6Al4V than AISI 316L. Biocorrosion study of mentioned alloys was carried out in essential medium culture of Dulbecco�s Modified Eagle Medium (DMEM, pH~7.2) at temperature of 37�. Electrochemical corrosion tests on both alloys indicate that the formation of passive layer on Ti6Al4V and as a result its pitting resistivity will be higher in comparison to AISI 316L. 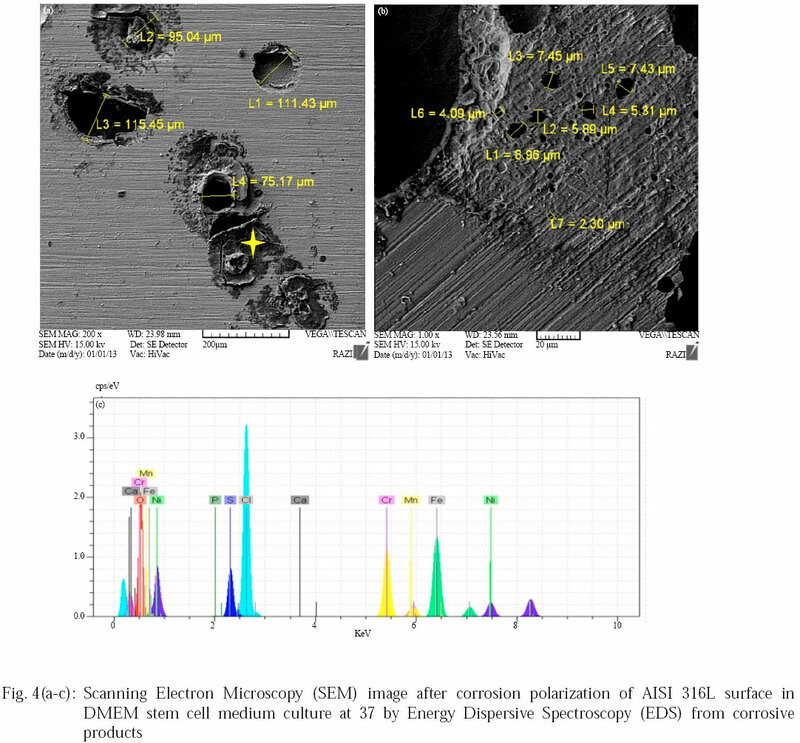 Also, polarization analysis, Scanning Electron Microscopy (SEM) and Energy Dispersive Spectroscopy (EDS) results prove that AISI 316L is very sensitive to pitting corrosion in DMEM medium culture. Preserved skeletons show that bone diseases have affiliated man since before recorded history. The use of surgical implants is not new approach for these decades. Substitutions of bone parts for repairing damaged portions of human body are the main goals in last decade in field of tissue engineering. Metallic biomaterials are metal implants that are planted inside the body especially in bone replacement field due to their superior load bearing, mechanical and etc. metallic biomaterials are used in biomedical devices for various parts of the human body like artificial joints, bone fixation devices, dental implants, orthopedic wires, crowns, clips and artificial hearts1. One of the most important criteria for bio-metallic implants is their non-corrosive behavior in appropriate tissue-material interface2. The implanted material is exposed to body fluids, such as intercellular fluid and blood depending on the surrounding tissue. Body fluid consists of inorganic ions (Na+, Cl-, Ca2+, HxPO4n� etc. ), amino acids, proteins and organic acids. The pH of body fluid is buffered at 7.15~7.35 but it decreases down to 5.2 during an inflammation reaction3. The kind of cell in the surrounding tissue depends on the part of body and varies as time proceeds after implantation. Just after implantation of the material, macrophages assemble around the implanted material as the initial stage in a foreign body reaction. Because macrophages secrete active oxygen species which chemically attack the surface oxide film of metallic materials, the influence of the presence of macrophages has been investigated4,5. Lin et al.5 reported that the presence of macrophages alone does not always accelerate the corrosion of metallic biomaterials. Besides active oxygen species, macrophages secrete fibroblast growth factor, inducing fibroblasts which produce collagen and polysaccharide for encapsulation of the implanted material. The thickness of capsular tissue depends on the biocompatibility and the size of material. With the cure of inflammation, the macrophage disappears within a few weeks and the cells originating from the surrounding tissue adhere to the surface of material. The cells use cell adhesive proteins to adhere to the surface of the material and produce an Extracellular Matrix (ECM) with a characteristic composition depending on the kind of cell6. Dental implants and coronary stents were developed in the last few decades and Zr alloys and Ta were relatively recently applied to the acetabular head and stem of artificial joints, respectively, in addition to the most commonly used metallic biomaterials such as Ti6Al4V alloys, 316L stainless steel and Co-Cr alloys are well-known7,8,9,10. On the other hand, the proper evaluation environment and techniques, taking into consideration the characteristic factors in the environment to which the materials will be exposed, have not yet been developed for these relatively new usages of metallic biomaterials. Regardless of the kind of devices and the part of the body, the corrosion resistance of metallic biomaterials is evaluated in saline, phosphate buffer saline solution, simulated body fluid containing only inorganic ions and medium with and without the addition of serum11,12,13,14. Due to clinical application of AISI 316L and Ti6Al4V alloys, the corrosion behavior of aforementioned alloys and metallic ion release in a biologic medium like blood plasma is our scope in this study. 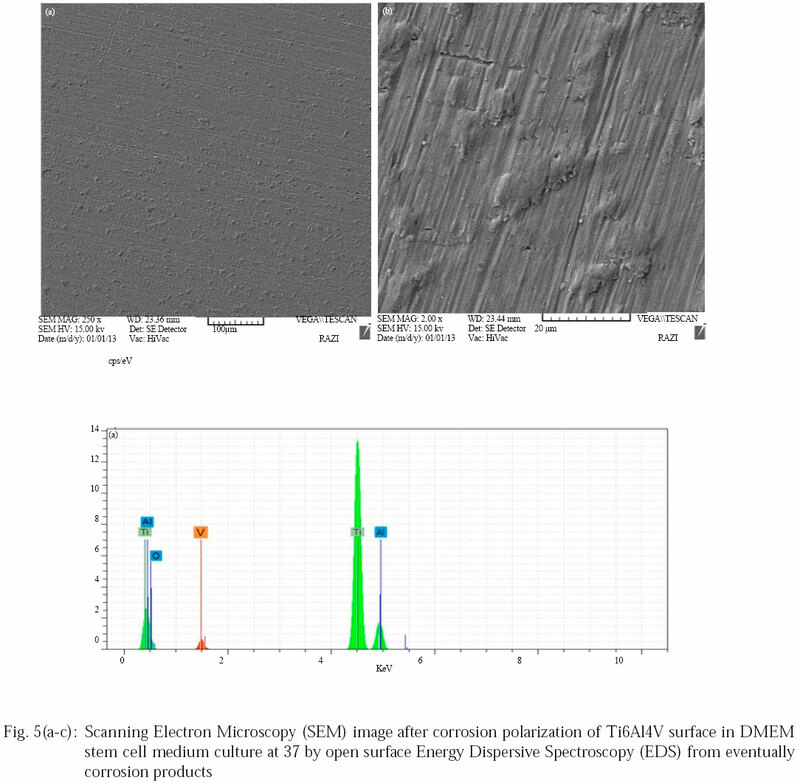 To examine the environment formed on the surface of metallic biomaterials in cell cultures medium and type of corrosion, the surface of Ti6Al4V and the AISI 316L alloy steel rods were immersed in DMEM medium culture (Dulbecco�s Modified Eagle Medium) for electrochemical measurements in cell culture environment. To observe the effect of corrosion on surface of the alloys, Scanning Electron Microscopy (SEM) examined for this aim. After that, the corroded surfaces were brought for culturing the WJ-MSCs in contact with corrosion products to survey the behavior of mesenchymal stem cells growth and their viability. To observe the viability of cells, the Fluorescent Microscopy was utilized. Observation of cultured cells is desirable to check the biocompatibility of the material as well as the cell coverage. However, the living transparent cells on the metallic material cannot be observed by optical microscope. In situ observations using fluorescent labeling of a certain protein in the cell body or observation after the experiment with fixation and staining are recommended. Sample preparation: For culturing the WJ-MSCs and electrochemical measurements, the AISI 316L and Ti6Al4V alloys rods were cut into 5mm height and 5mm in diameter according to ASTM F 138-08 and ASTM F 132-02, respectively. For electrochemical characterization, the samples were mounted with resin and electrical connection was setup. To obtain fine finished surface without any roughness, the mounted samples were polished with abrasive paper of 60, 180, 220, 400, 600, 1000 and 1500, respectively. Finally, the samples were washed by de-ionized water and ethanol for degreasing. The chemical compositions of characterized alloys were showed in Table 1 and 2. Electrochemical corrosion measurements: To analyze the electrochemical corrosion behavior of AISI 316L and Ti6Al4V alloys, the electrochemical behavior of these alloys were investigated using Impendence Spectroscopy (EIS) and Potentiodynamic polarization (PDP) methods. The electrochemical measurements were carried out using IviumStat� Potentiostat (CompactStat-Netherlands) system and conventional three-electrode system with a working electrode, Saturated Calomel Electrode (SCE) as the reference electrode and platinum auxiliary electrode. The Open Circuit Potential (OCP) was measured after 60 min since sample immersion in DMEM medium. Impedance measurements were performed by applying a sinusoidal wave of 10 mV in amplitude to the working electrode at a frequency range from 100000 to 0.01 Hz. Anodic polarization curves were drawn from the corrosion potential to the breakdown potential. At this potential, a cathodic sense was imposed. The curves were registered at a scanning rate of 1 mV sec-1. The tests were carried out at 37�C with a medium pH stabilized "between" 7 to ~7.2 as simulated body temperature in water bath. Finally, the polarization tafel measurements were performed at a potential range from 0.2 to 0.9 V at a scanning rate of 1 mV sce-1. All data were analyzed by IviumSoft software. Isolation and Culturing of Wharton�s Jelly Mesenchymal stem cells (WJ-MSCs): Wharton�s Jelly Mesenchymal stem cells (WJ-MSCs) isolated from cord tissue of the infants delivered by cesarean section with informed parental consent. Umbilical cord vein were flashed by Phosphate Buffer Saline (PBS) to remove the blood clots. The umbilical arteries were removed and the rest was minced into small pieces. The pieces were explanted in culture dishes and cultured for 10 days in DMEM (Table 3) containing 1% L-glutamine and 1% penicillin/Streptomycin. After separating the pieces of tissue from the floor of culture plate, the cells were harvested by trypsin/EDTA and subcultured into a culture flask. The cells at the passage 3 were established by detecting CD markers. FITC-conjugated anti-CD44, anti-CD90 and CD144 antibody, PerCP-conjugated anti-CD105, PE-conjugated CD106 and PE-conjugated anti-CD34 antibody (all from Abcam, UK, Cambridge) were used to detect the CD markers. The percentages of positive cells were assayed by flowcytometry. The flowcytometry showed that the 6.96, 47.67 and 92.04% of the cells expressed CD44, CD106 and CD105, respectively. The cells did not express CD144 and CD34. The Flowcytometery results were showed in Fig. 1. Electrochemical impedance spectroscopy (EIS): Figure 2 Representative Electrochemical Impedance (EIS) diagrams obtained from AISI 316L and Ti6Al4V alloys in DMEM solution, for as received conduction. Bode and phase-shift plots derived from EIS experimental data are shown together with the fitted data generated using the equivalent circuits shown in Fig. 2c. A very good agreement between the fitted and experimental data is obtained as it can be confirmed by values given in Table 4. The impedance data obtained for Ti6Al4V and AISI 316L are simulated by a simple Constant Phase Element (CPE) couple (Fig. 2a), in which Rs is the solution resistance, CPEdl corresponds to the double-layer capacity and Rpa is the charge transference resistance of the passive layer. In the Bode diagram (Fig. 2a), impedance modulus at the lowest frequencies of about 106 Ω and phase angles near -90� at the lowest frequencies are observed. The high Rpa values, about 106 Ω (Table 4 and impedance Bode diagram), indicate the formation of a protective passive layer that confers a high corrosion resistance to the Ti6Al4V alloy and AISI 316L in low current. The comparison of Rpa values for both alloys represent that they have same corrosion behavior in low current density due to their passive layer of Cr2O3 and TiO2 for aforementioned alloys, respectively. Tafel potentiodynamic polarization (PDP): Figure 3 shows the anodic and cathodic polarization curves for Ti6Al4V and AISI 316L alloys in the as-received condition. In Ti6Al4V the passive current density is very low which indicates the high corrosion resistance of the Ti6Al4V alloy. In contrast, no increase of the current in the studied interval is observed for Ti6Al4V. It remains passive up to 900 mV Sec-1 which indicates that Ti6Al4V possess highly resistant passivation films. Figure 5 represents the significant influence of passive layer of TiO2 on non-corrosive behavior and attacking of chloride ion on destruction of Ti6Al4V alloy. Energy Dispersive Spectroscopy (EDS) analysis for Ti6Al4V alloy proves that there are no significant corrosion products on top layer of this alloy. For AISI 316L alloy, active behavior during tafel polarization shows that this alloy is going to critical and unstable level by increasing of electrical current density. As a result, the current density of AISI 316L, suddenly, at potential value of 0.5 V has a huge breakdown due to pitting corrosion. In the electrochemical system the electrolytic hydrogen and oxygen ions occur. Therefore, there is a large electron flow which can cause a current increasing and different anodic and cathodic polarizations. This polarization is practically confirmed by the Tafel slopes (βa and βc) shifting16,17,18. In DMEM medium culture (Table 5) almost all the contents is containing of Cl� ion; chloride ion beside NO3�and SO42� is one of the most destructive ion for corrosion of metallic alloys specifically AISI 316L. Pitting resistance is important, mainly in applications involving contact with chloride solutions, particularly in the presence of oxidizing media. These conditions may be conductive to localized penetration of the passive surface film on the steel and a single deep pit may well be more damaging than much greater number of relative shallow pits. SEM images in Fig. 4 represent the damaged surface AISI 316L and prove that this alloy is very sensitive to pitting corrosion by increasing of current density. One of the most hazardous effects of this type of corrosion is metallic ion release and decreasing of tissue-material pH. EDS analysis in Fig. 4 for AISI 316L shows that the corrosion products are numerous. Ryh�nen et al.19 measured the release of nickel from orthopedic surgical materials (nickel-titanium-alloy Nitinol, stainless steel AISI 316L). Initially, Nitinol released more nickel (129-87 mg L-1) into the cell culture media than stainless steel (7 mg L-1), but after 2 days the concentrations were about equal (23-5 mg L-1 versus 11-1 mg L-1). Assad et al.20 measured the release of nickel from Nickel-titanium (NiTi), pure nickel (Ni) and pure titanium (Ti) powders and also from stainless steel (AISI 316L). The release rate of Ni in the different semiphysiological solutions decreased in order: pure Ni, AISI 316L, NiTi, Ti and controls. Culturing and Viability of WJ-MSCs on corroded surfaces: The 12.5x104 cells were cultured on each alloys after PDP test in the presence of DMEM containing 10% FCS, 1% L-glutamine and 1% penicillin/Streptomycin for 10 days. For detecting the cells on the alloys, the cultures were fixed with 4% paraformaldehyde. The cultures then washed with PBS and immersed in 10ng/mL DAPI (C16H15N5 -Sigma Aldrich) for 5 min. The cultures were washed and observed under a fluorescence microscopy. 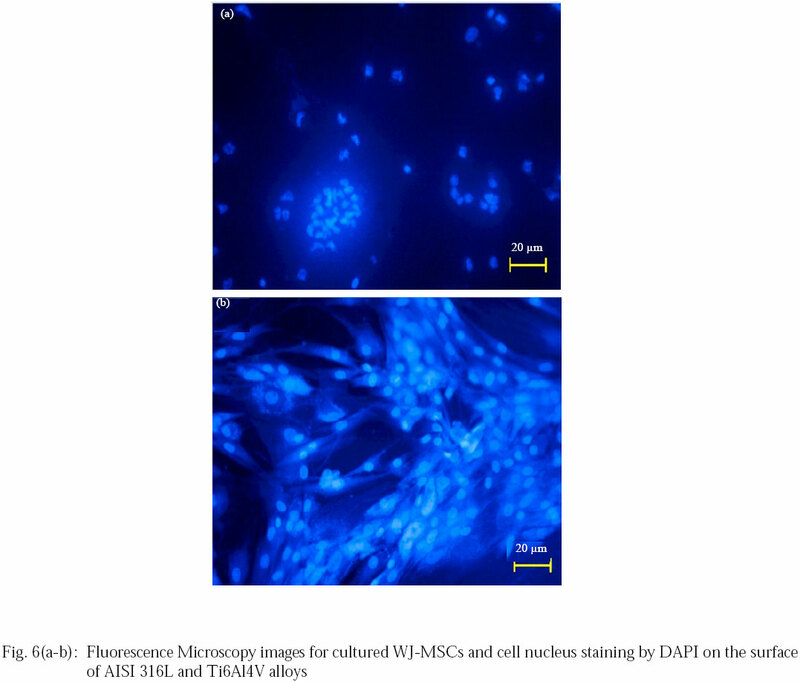 The data from DAPI staining showed the cells could attach on all alloys and the Ti6Al4V alloy is not toxic for WJ-MSCs; however, the cell population was shown difference in number. The number of cells cultured on the Ti6Al4V alloy was more populated than the other cultures (Fig. 6b). Ultrastructural observations showed the morphology was also different in the cells grow on AISI 316L. These cells had round-shape morphology (Fig. 6a) while the cells were cultured on the Ti6Al4V expanded and had a satellite-shape morphology (Fig. 6b). Due to presence of corrosive products on the surface of AISI 316L, the ability of cells for growth in equivalence with corrosion products decreased and shows a lag in adhesion and viability of cultured cells on this alloy; but some still alive and could be observe under fluorescence microscopy. Park, J.B., 1984. Biomaterials Science and Engineering. Plemun Press, New York,. Shreir, L.L., 1979. Corrosion. 2nd Edn., Buttherwoths, London. Hench, L.L. and E.C. Ethridge, 1975. Biomaterials: The interfacial problem. Adv. Biomed. Eng., 5: 35-150. Fraker, A.C., 1987. Corrosion of Metallic Implants and Prosthesis Devices. In: ASTM Metals Handbook, Volume 13: Corrosion, Korb, L.J. (Ed.). 9th Edn. ASM International, Metals Park, OH., USA., ISBN-13: 978-0871700193, pp: 1324-1335. Burstein, G.T., 2005. A Century of tafel�s equation: 1905-2005 a commemorative issue of corrosion science. Corros. Sci., 47: 2858-2870. McCafferty, E., 1979. Corrosion Control by Coating. Science Press, Princeton, New Jersey, Pages: 279.